How much faster will train timetables be? For drivers, school holidays must seem almost magical with traffic seemingly vanishing for a few weeks. Commutes that might normally take an hour in mind-numbing congestion can, for a few weeks, be achieved in less than half that time. On the motorway, the speedo might even reach 80km/h or more even during the traditional peak hours. I don’t have a number of the exact impact of school holiday’s but I’ve seen suggestions that suggest it represents only a 10-15% decrease in traffic volumes. That might not seem like much but it’s enough to take significant pressure off our roads. I think school holidays are also a great reminder of what might be able to be achieved if we had our PT and active modes working well. At the same time, it highlights that despite significant improvements in PT in recent decades, we still have a long way to go. So what would it take to get public transport attractive enough to draw enough people out of their cars to emulate school holiday conditions? Ultimately, most people will make rational decisions on how they get around. They will generally use what’s fastest and most convenient. Price will also play a part, but that will mainly be the cost of driving and parking. To me, getting services fast enough to attract significantly more people doesn’t have to mean that PT will be faster than someone driving off-peak or during school holidays (it would be nice though). But it has to be much closer than it is now. 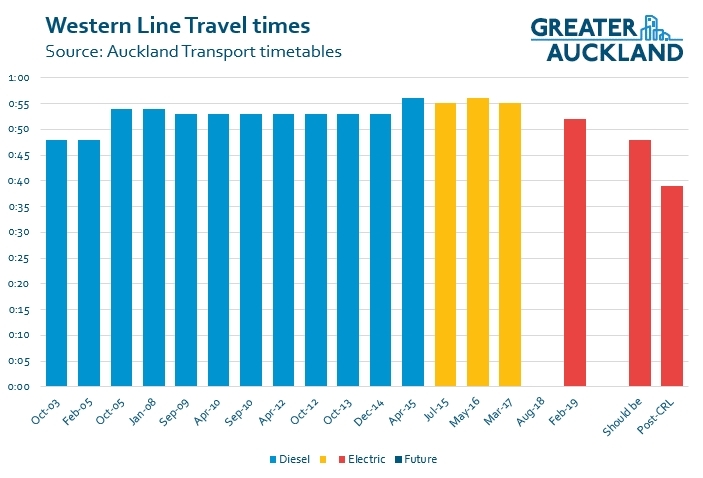 There are plenty of stories out there from people who’d be happy to take public transport but it would take say 1hr 20 to do via PT compared to an off-peak driving option of 30 minutes. Obviously driving at peak times would be more. But how different would perceptions be if the PT option took say 40 minutes, what about 50? These longer travel times are usually not for travel to the city centre, which is generally well covered, but to many other parts of Auckland that may require people to transfer services to reach. Saving 2-3 minutes is good but how much impact will that actually have? What the modelling suggests should be possible with the City Rail Link in place. What you can see is that even with the improvements we’ve seen so far, the electric trains are slower they were with diesels. Thanks in part to the longer travel times, the new trains are much more punctual though – where previously trains might arrive on time only ~80% of the time, now it’s in the high 90’s. If the new timetable/s delivers the full 3-minute saving mentioned above, at 52 mintues it would finally, just, deliver us services faster than the old diesel timetables (from late 2005 onwards). Thinking further to the future, we believe the trains should be capable of travelling even faster – which would match the 2003 times. And finally, with the completion of the CRL they should come down even further, possibly as low as 39 minutes. At point, travel to the city at least becomes faster by PT than by driving at peak and at least competitive with driving off-peak. Thanks Matt. Interesting post and data. Fully agree with you regarding journey times. I commute via bus, not train, and in the last couple of years, frequency on the 973/974 Birkenhead bus lines I get has increased enormously, which is greatly appreciated. This, along with the double deckers (thank you! ), has meant that capacity is greater and many buses are a lot less crowded. Bus lanes up as well as down Onewa Road have meant that buses are more efficient at peak time. Sadly, however, with increased frequency, came an increase in journey times. One of the most frustrating aspects of taking these buses is the journey home where, if I take the wrong bus, I can end up waiting 5 minutes at Highbury, 5 minutes at Verran’s Corner, and up to 5 minutes at Beach Haven. I hope that when the new timetables come in, some account has been taken of this, but I’m not holding my breath, because it obviously works for AT to have “on-time” performance, and this is the easiest (not the best) way to achieve this for them. So yes, fully support faster journey times across all modes. Agree with you, the lay up times, left right and centre for the 97 buses is incredibly annoying and a turn off. There should be NONE! It is absolutely designed around AT satisfying themselves that the service is on time and little to do with getting passengers to their destinations! Add to that the drivers crawling the buses along at 30-40 km/hr to pad out the trip time. Yes I realise at times heavy traffic is an issue but mostly it is not and GPS tells most people the real arrival times anyway. The other issue with that route is the bus stops spaced ludicrously close together in places. Why two stops in Highbury 300 metres apart, why not one only? Or at the bottom of Onewa that are about 100 metres apart? Can I suggest some of the very well paid decision makers at AT actually use these services to see for themselves! I’m with you all the way, Waspman! Good suggestion, Waspman, but I believe they are already doing so. It’s just that they’re not just designing for the commuter (see my point below). They do need to make sure the mid-trip stops run as closely to timetable as possible too. Any transport that mixes with general traffic will have this problem, which is why we need dedicated PT transport corridors of whatever type, and bus priority that works. But our point is that they’re being over pessimistic with their timings. Absolutely, on-time performance is important, and we need to run to timings mid route: I often catch the bus at Highbury, etc, but if so many services are running early and padding time to this extent, this can be whittled back, which I hope will happen with the next round of timetables. As I said though, I’m not holding my breath, because on-time performance seems to trump (excuse the unintended pun) efficiency of service, as it looks good on paper. Yes but how much of this is day to day variation, it only take a wet school day and you are back to being late again. How do you ‘whittle back’ the timetable when a bus might run ten minutes early one day but ten late the next? I’m not sure what the solution is, but surely it isn’t artificially slowing down someones bus journey when the roads are clear. This is doing nothing for getting more people onto PT. I would have thought having more fat at the end of each run would be the solution. @Nick I think in general it would be a lesser of two evils for passengers if it erred on the side of being late sometimes rather than systematically padding and slowing to avoid this. In effect either way the passengers are being held up, but if it is by design it can’t be avoided or made up for. For turn-up-and-go passengers running late doesn’t matter but padding does. There are also some who could productively use the variable time before or after, particularly with real-time letting them know when to go, that they couldn’t do with padding. Lastly I suspect by burying it in slow timetables it creates less visibility of the source of delays and I imagine less incentive to address them. Note: not meaning be completely unrealistic like the 1990s train timetables where they were late 99% of the time, but designing to be late some of the time I prefer to being overly conservative. In fact the spacing between stops at the top of Onewa give or take a few metres is 170 metres from the second to last stop going up Onewa to the stop at the top, then 180 metres from that stop into Highbury, then 290 metres to the next stop in Highbury, then about 150 to the next just outside the shopping area. Ridiculous or what? Add to that the bus encounters 5 pedestrian crossings in that 290 metre trip, 4 raised that slow the bus to sub 20 ks per hour. Now virtually all commuters avoid Highbury like the plague because it is so slow to pass through. And there are some bus services that go “via the bypass”, but most do not. And yet and despite buses stopping at either end of Highbury on main roads, AT feel the need for buses to pass through this place where time goes backwards. Get rid of services passing through here and a trip off peak would not be too far off a car commute, all things considered. And at peak far quicker than a car to the city! As soon as the bus frequency is high, the on time punctuality isn’t that important. For most turn up and go bus, the on time punctuality KPI should change from arrival time to waiting time between two bus (frequency). It is time for AT to review its definition of punctuality to get rid of the unnecessary inefficiencies. True. Given a 10 min service I would just wait. But I have a 25min service (two different buses service the route I commonly use and the max wait interval is about 25 min). When busting a gut sweating the 1km uphill to the nearest bus stop it really bugs me seeing the bus from afar departing say 2 min early. However I’m contemplating getting one of those clever phones that has an app that I’m told will let me know where the buses actually are. With luck I will be able to time my walk to being a gentle unhill stroll and I have time to stop and smell the roses. Catching early afternoon buses around Akoranga Dr/Northcote Rd the other day the timetable was terribly lumpy. An early bus meant our planned route home was wrecked and the next bus was right on time (as getting around busy time again I suspect the reason) so waited the most you ever could. I won’t bother complaining to AT or anything as the new network is about to be rolled out & looks like frequency is high enough for it to not have mattered in this situation. I often wonder what improvements to travel times could be made if Kiwi Rail increased the track speed on the Western Line. It is my perception that trains on the Southern Line travel faster than on the Western Line. I can only remember 40 signs on the Western Line. Kiwirail could increase times but only by doing some major civil engineering on the route. For example the 50 k curve into New Lynn from Avondale could be increased if the curve was relieved, by buying a few properties around St Georges Rd to straighten the approach and realigning the Whau Creek bridge to line up better with the trench into New Lynn. But all of that is highly unlikely. As it is the curve speeds are very slow but are as safe as possible and there is no realistic margin to increase them. Good post Matt. The question I have is do I have the time to use PT all things considered? The answer frequently is no. “At point, travel to the city at least becomes faster by PT than by driving at peak and at least competitive with driving off-peak.” This is key. Driving is often door-to-door. Add in the time to travel to and from the station at each end. Is it still quicker then? Yes, and I think this decision should guide investment decisions. If PT is not faster, what infrastructure can we reallocate from private car travel to public transport travel to make it faster? I think you meant that facetiously Heidi but I entirely agree. People will choose a 60 minute drive over a 90 minute door-to-door PT commute every time. PT has to compete with driving, and it needs an equal footing to do it. Glad you agree; I wasn’t being facetious. 🙂 When someone says that PT takes too long, so they have to drive, I reply that PT takes too long, so some roading needs to be reallocated to it to make it faster. Perhaps driving will become slower in the short term, but haven’t we heard from the places like Copenhagen where PT and cycling is great, that the driving there is great too? In which case the slower driving may just be a temporary glitch until people have the modeshare they’re actually wanting. After all, space-efficiency is key to moving people time-efficiently. Driving is only door to door for some in the city. Have to add circling for parking time too! Driving into a parking building, winding up to a free space, then getting down to the ground and walking to where you are actually going is a very time consuming process, even worse exiting if it’s busy. This is one of the main reasons why I take PT whenever I can – I absolutely despise looking for a park. My idea of parking hell: St Lukes Mall at Christmas time. Thank you AT for the new frequent Route 20! For me the biggest time-consuming element of using a parking building is searching for your car because (always!) I fail to note where I left it. That’s a common argument, but tends to ignore that most workers in a city centre won’t have on site parking. If we take the CBD as our point of interest, on site parking is for those who are: field workers, upper management, late/early shift workers (often shared with other users), on bloody old contracts (how I got company parking in Stanley St). Lets throw this into Google Maps. Travelling from my home in Ellerslie to the Caltex in Stanley st (7-8km), arriving by 08:00. Here’s the results. 3) Southern line service – 26 mins, leaving at 07:28. So for this one example, the travel and departure times are only the same if there is on site parking. If I have to find a car park, the near ones will be full by then so I’ll have to arrive earlier to park close, or arrive earlier to park further away. Even choosing from The Mall in Onehunga, the departure times don’t change much – Train leaves 10 mins before the car and takes 45 mins (including a 6 minute walk to the Onehunga station) vs 22-35 for a car. Take away the walk to the station and the times are almost the same. Consider the parking argument and things are equal again. plus the walk is exercise towards a daily total for health benefits wheras car is dead time sitting in a bubble. I seriously think there is potential for AT to partner with the DHB in promoting a “walk to the bus/train/ferry” campaign – with health benefits as well as getting people off the road. What’s not to like about that? I’m surprised it hasn’t happened yet. And I’d increase it to include cycling to the PT… just need a whole swag of bike stands at bus stops to support it. That would be a very effective service marketing initiative David. IMO – any frequent service ‘ie; peak time trains and frequent route buses’ shouldn’t have a time table – scheduled departure time but they should not have to wait at stations or crawl at slow speeds to ensure that they are on time and not early at stations. Buses especially, if they’re early they wait, if they’re late well they’re just late – in theory if a service is every 15 minutes, the next service will be behind it shortly, no need to wait for a scheduled departure time at a mid way station. But if you don’t have timing points they will rapidly bunch together, and the next service will be not shortly behind, but exactly behind. Instead of one by every fifteen minutes you’d end up with four buses in a bunch every hour. That’s true, so how do you balance on-time reliability with efficiency? (ie what balance between having overly-pessimistic and optimistic timing points? At the moment, many of the services I take are clearly running ahead of schedule then waiting, which is frustrating, although the on-time stats look great on paper. Yep that balance doesn’t quite seem to be there – especially with bus services. Southern Gt South Rd 33 bus services are shocking for the padding during off peak and bunching during peak. IF appropriate bus priority was more prevalent then maybe bus bunching wouldn’t be a problem. I drove buses in Christchurch many, many moons ago, and early departure was a capital offence. TBH I wish it was the same here in Auckland now – the number of times I’ve arrived at a stop (knowing the scheduled time from that stop) to find that the bus is already a couple of hundred metres down the road. And even the trains do not seem to be averse to leaving a minute or so early. It’s not a good advertisement for the system when you’re cutting it fine to find that the train has already left before the scheduled time. The other problem is that people need to know what time it is arriving at a stop along the way. You can’t exactly use the buses for doing a number of errands on your way home, or whenever, if you’ve no idea what time it’ll come. We don’t want to design a bus service just for the commuter. Yes, turn up and go works for everyone. Can you monitor on your journey where the potential holdups are? I would have thought that giving the bus priority in the places where *sometimes* the bus is held up means the timetable can then have the slack taken out of it. Absolutely the worst bunchup ever: I waited at Akoranga for eight minutes, then two (citybound) NEXs arrived at the same time. People started boarding the first one, but due to window tinting it wasn’t possible to see that many were standing in the aisles until it became obvious when no more could get aboard. Meanwhile, the second bus had dumped his passengers and then he took off, leaving several of us still standing on the platform, although he had plenty of seats to spare!! It looked like they had travelled bunched up for most of the route, with the first bus doing all the picking up, so the driver assumed the same thing would happen at Akoranga. Perhaps if the windows weren’t tinted and covered with advertising, he might have realised that standing passengers means the bus is full. The bunch up problem should be addressed by bus waiting at the first bus stop (departure time), not during the journey. For example if the bus ahead is behind schedule, the next bus should wait a few more minutes at the first bus stop before departing. If the bus ahead is ahead schedule, the next bus should depart earlier at the first bus stop. If the bus is turn up and go frequency, it shouldn’t be an issue for bus to depart early, since the next bus will be here soon. What is need is a bit more communication between buses. The pros is the bus will not slow down during the journey to fit the timetable, and also address the bunch up problem. Yes. On a turn up and go route that would work a treat. I wouldn’t say 15 minutes counts as shortly. Even 10 minutes is just a bit too long of a wait for me to ignore the timetable. Maybe if it was every 7 minutes I wouldn’t be assiduous in timing when I leave home to catch PT. Also, I would catch the 14W/T bus (from Westgate to New Lynn) at the Kelston end into New Lynn for the train. The buses leave every 15 minutes from Westgate, but take different routes at the start, so even though the timetable says every 15 minutes, it’s actually every 10 to 20 minutes because they don’t stop to match the schedule. It’s too unpredictable, so I just walk to Glen Eden train station instead. Yes, I could check the App, but I’d rather not have to. Heidi, Just maybe! There is a bus stop on Burns Ave, Takapuna that at most I have seen half full (one bike) and I have never seen the 16 odd bike rack at Akoranga Station full. Is that a reason not to build bike racks? No, but let’s be judicious about it. You can’t have been to akoranga between 10am and 2pm if you’ve never seen the bike rack full. Faster track speeds equals Faster train services. Even better & faster services with reduced dwell times. AT needs to increase speed, convenient to use their travel services & price being competitive to the cost of driving and parking. Continuous Improvement is needed AT. shorter dwell times also equals faster train services! Removing level crossings and the safety margins applied within ETCS will also increase line speed by reducing delay. Once there are no more level crossings within the metro network and the deferred maintenance would have been caught up on as well, then it might be time to look at faster track speeds, but I’d guess that there is a lot to be done before faster track speed should looked at. I’ve largely abandoned public transport recently, door to door Howick to Viaduct was taking 1:10 on the bus / train combo. I can cycle it in 55 minutes, easy decision in all but the worst weather. Needs higher bus frequencies and faster trains. Without being condescending, good on you for taking a healthy approach to your travel but are you comparing apples with apples? Are you arriving in a state where you can get straight to work, after a detour by the coffee machine, or do you need to shower before work? Most people shower before work irrespective of how they travel there. It doesn’t affect the time taken if you shower before or after the commute. Disagree, across many workplaces I have consistently found showering at work is quicker than showering at home. The quiet home environment must make me linger for a luxurious long shower, or maybe it’s that at work, with my desk so near, i am thinking, the sooner i am there the sooner i can leave for home. And if you really dislike showering at work, ride a little slower in summer or get an ebike. i take longer showers at work since the boss is paying for the hot water! I ride an e-bike, so there’s no need to shower. Likewise in the morning the trains appear to linger around the Spark arena for a few mins every day until they get a platform. Very annoying. I appreciate I’m a bit of an edge case in opting for the e-bike when most would retreat to the car, but the general dissatisfaction with the current speed / frequencies are still common. Ditto. Given up on buses. My commute from Te Atatu Peninsula to Newmarket by bus is 1h at best, 1h30min on a bad day. I can ride that (on an e-bike) in under 40mins. No bus priority being the main reason. Also AT decided to introduce a timing stop for route 132 at Taikata Rd, meaning that even if bus happens to reach Peninsula early (during school holidays even 15min is not unheard of) it waits at the timing stop, making sure that the 12km trip from CBD to Peninsula is always at least 45 minutes. Getting to and from Te Atatu Peninsula is unpleasant by bus. There are only two dedicated routes, one to the city and one to Henderson. In my view, city bus 132 should be frequent as it offers a very good connection with the 18 and 66 in Pt Chev, 20, and Outer Link. The main section of Te Atatu Road leading from the motorway to the village is unnecessary being two lanes for traffic with no dedicated bus lanes. It also had a dangerous crossing near the Cellarmans intersection (which is also where the northbound cycle lane crosses over). The traffic always speeds there, despite a limit of 50 km/h. My experience usually involves catching the 138 and 131 combo which can take 45-60 minutes depending on the transfer (which involves crossing busy Te Atatu Road). Twice also on this journey, AT HOP has stuffed up the tagging sequence resulting in phone calls to Auckland Transport to sort out refunds. I did try to catch the train from Newmarket to Henderson and then 131, but 131 has such pathetic frequency at peak (30 mins) and poor reliability (not unusual for it to run 15-20 mins late) that I’ve given up on it. Also the weird loop around Henderson (via Ranui, Alderman) can easily take 20 minutes at peak. At that stage Inner Link + 132 ends up being a faster option. I’ve asked AT about bus lanes on the peninsula – the answer – not enough buses to justify dedicated bus lanes. And obviously people don’t use buses are they hopelessly get stuck in the same traffic as cars, so no hope for improvement there. Nothing tells you more that you’re a second grade citizen than sitting on a stationary bus for 15 minutes due to ‘operational’ reasons. Those buses (both 132 and 131) should run the full loop for drop off, wait at the starting stop and run another one to collect passengers. The whole loop takes less than 10 mins to complete. Upgrading the track from freight-grade to passenger-grade over the next three to five years, would be well worth the time and effort. Nice call Rob. The ride on Auckland trains – even on straight, flat parts of the Southern Line, for example – is really rough. We’re being massively let down by KiwiRail. Electrifying railway lines in Auckland, complete with new trains and double tracking, only really works well timetabling-wise, when the track is at passenger service grade. We keep ignoring the track, spend the money somewhere else and wonder why we still have service issues. Service journey speed and time is not just dwell time, service scheduling and operator performance. The quality of the track dictates how quickly you can run trains – freight and passenger. Not spending money on track for passenger services, is like spending money to make a shoe or boot upper look good while ignoring the sole which is worn down, uneven and cant get a grip on any surface anymore. Spend the money on getting the AKL suburban track network up to passenger grade – where the ROI produces multiple positive outcomes. Attention Central Government: give Kiwirail the money to upgrade the exisiting track in Auckland where EMUs are running. Its not an expensive exercise. Continually penny pinching on track quality (incl maintenance), just doesnt work and only causes more problems. What is (actually) the most important thing in the (railway) world? Its the track, its the track, its the track. My point is that you can’t schedule your services to take account of the one day in 10 that runs over, and to hang with the other 9 days that all have to wait. The bus lanes on Onewa, etc improve reliability, so the next step is to look at which services are consistently (enough) running ahead of time. What data is being collected on this? It would be easy to do, if the motivation was there. Yes, Jezza… this is where the Birkenhead run is particularly frustrating for passengers and schedulers! It ends in a loop, so effectively someone will always be inconvenienced, because the end of the run is not the end of the run for everyone, if that makes sense… It’s also a nightmare to look at the real-time boards on the app, because your service might not be logged on as that service yet, so you don’t know where it is, etc. It’s a particular conundrum because of the loop, but I wonder what they do overseas? The Circle line in London has a similar problem, but people are encouraged to transfer to the “next service”. BTL seem to prefer you to sit silently for 5 minutes at a pop while other services zoom by. Yes, but even though it’s now a “spiral” terminating at Edgware Road, in practice you find that people travel east and west beyond that point, and have to change trains to get the next one east or west. So scheduling wise, it’s like a spiral, but in practice, many people use it as a circle, and change trains here. Higher train speeds are nowhere as effective at decreasing times as reducing the number of stops, ie. providing express services. To do that requires additional tracks (and a flying junction or 2 would help too). Better get started. …and extra slots at Britomart. There are not going to be any express services before the CRL opens, we should have a third main by then. Kiwirail originally envisaged the third main as being unwired and solely for freight. Have they accepted wiring it and sharing with express passenger services? Does the third main have funding? As for the Westfield flying junction: that would improve timings on all services (freight included). We have seen some very detailed designs but has it progressed beyond that? I believe it does have funding and that includes overhead wires. It’s not really realistic to have it without wires, as I imagine they will use all three lines for both suburban services and freight depending on where the train is positioned. For example a northbound freight service would be best using the westernmost track, while a southbound eastern line service would best use the easternmost track. No point in having trains crossing unnecessarily. If it’s not wired then it isn’t a third *main*! I wonder if removal of more level crossings will help speed up services? The Western Line has several stations adjacent to busy crossings (esp. Avondale). However I don’t know what the solution is without shutting the line down for half a year to trench the lines and rebuild the stations. A high proportion of Western line stations have that problem – Ranui, Glen Eden, Fruitvale Rd, Avondale, Baldwin Ave, Morningside, Mt Eden. iirc AT have set the system so that the trains have to clear the crossing before they can accelerate to line speed, reducing that crawl distance at each crossing would add up to quite a time saving. All these little things add up. I’m not sure that is 100% true. For example it takes 35 minutes on the 8:45 AM 25B bus to travel the 6.5kms from Mt Roskill Shops to The Civic at an average speed of 11km/hr. It might be frequent but it is anything but fast. you should catch the 253 @ 8:39, it takes only 25 mins. I really wish they would reroute all dom rd busses down ian mckinnion / queen st. Consider it a trial for when the trams come in. But then they wouldn’t be able to use ‘Symonds Street is at capacity’ in the business case for light rail! As a resident near View Road, it seems to me some people are driving into the vicinity of View Road to catch the 25B/L there. The on street parking gets full pretty early on week days. Meanwhile, there is loads of parking space on the side streets off Dominion Road, just beyond the change in fare stage. According to the AT journey finder, it’s about $1.00 more one way for boarding the bus earlier than Valley road when travelling to the city. For local residents, this does create a problem. But it explains the large amount of people boarding in View Road at peak times week days. I feel it needs some research. Have a look at AT’s parking strategy, Tangledtimes. You might find there’s a planned strategy all ready to go, and just needs AT to be reminded. The needs of residents, commuters and shoppers are all different and it’s easy to tailor a strategy to ensure the right mix of availability is provided for each. Thanks, Heidi, but I don’t think it’s the residential parking strategy that is going to solve my problem.It would make it better for people being able to park outside their place in their street. Lowering the differences in costs between fare stages might be a big help here. More importantly for this discussion, I think the numbers of people boarding in View Road may be a reason for not having so many buses or express buses going more directly from Dominion Road to the city. My problem is, that, as a not so young woman, in the winter months, I have driven a short way to close to View Road in the morning on days I work. This is so that I am not walking home down dark back streets when I get off the bus in the evening. I have noticed in recent years it is becoming increasingly hard (nigh impossible now) to get a park near View Road in the mornings. It’s not a problem when days are longer as I can easily walk to and from the bus stop in day light. I have heard young people on the bus say they drive in to Valley Road area then get the bus from there. I don’t know how widespread this is so may need more research. Restricting parking near View Road, would also mean I can’t park there all day when the days are shorter as I live a bit further away down a back street. Recently I have found it better to drive in the opposite direction and park closer to Mt Roskill. I would like to see more incentives for people to get the bus from nearer their homes than driving as close as they can to the city, then getting a bus there. All valid points, as are the points you make in your later comment. Preventing “hide and ride” would have to be one of the strongest arguments for a flat fare structure. If the bus costs the same all the way from home, many people would choose to leave the car at home, or just to get to the closest bus stop if they need to for personal safety, as you do. Fewer cars leaving their home driveways means fewer cars parked on city streets, meaning safer cycling, too. And before I get clobbered by the anti-flat-fare brigade, of course I’m talking about with extra funding available, as is required for a progressive city that’s serious about modeshift. And of course I realise that there would be less incentive then, to live centrally. I think, in our “long PT times” city, this point is of very little relevance. People do value their time. Agree with a flat fare structure, Heildi, or at the very least, a much flatter structure than now. The fare stages are a very blunt instrument. And the current fare stages work against commuters from the outer suburbs, who are often the less well off these days. Didn’t AT lower the price of 1 stage bus journeys in the last year or two? If so, what i am seeing may be an unintended consequence of that. And i have heard drivers trying to avoid Dominion and Mt Eden roads use side streets that are cycling routes. How much can a flat fare structure just recoup itself through other consequent savings? On road wear and tear, traffic congestion etc? Heidi, absolutely wishful thinking. It is my bet that there is not a single suburb in Auckland where AT applies the Strategy as written. First, AT is required to do occupancy surveys at least every 12 months. If they were doing this would there be a problem in View Road? And then Policy 1C “when parking demand reaches a point where time restrictions are not being effective, AT will recommend priced parking”. Yeah right! And for example in 2014 a Takapuna report said that long term commuter parking should be reduced. Four years later and nothing has happened. Partly because of that AT feels they have to build a new parking building. I admire your optimism though that you think a conversation with AT will set everything right. Or maybe I just don’t ask nicely enough? Hence another reason to have distance based fares except for cash (in which case the existing zone based could be used). This perverse outcome could be avoided. With stops as close together as they are on the western line, increasing the maximum line speed is not very important. Reducing dwell times is. Where buses are frequent enough to be liable to bunching (thus destroying the whole point of the extra frequency), it’s all the more important to have bus lanes, to reduce the variability caused by traffic congestion, AND all doors boarding. All doors boarding reduces dwell time and, importantly, reduces the variability of dwell time. What exactly is the policy on rear-door boarding? I got frustrated by passengers on my local routes exiting via the front door and holding up people waiting to board. One day, while they were exiting, I boarded via the rear door and was immediately told off in no uncertain terms by the driver. The doors need to be bigger (double doors). Then you end up with something resembling a train. It really irks me that the bus system could be transformed into something much better for a few million dollars, a bit of parking space, and some willpower. Continuous 24×7 bus lanes, all door boarding, better signage, less bus stops, direct routes. Job done. I just don’t think there’s enough vision in AT to actually see a solution like that. Even buses could be useful and reliable if AT had the guts to remove on-street parking from many arterials and dedicate it to buses. Pshem, vision is not the problem. Have a look at their Statements of Intent – fantastic stuff. The problem seems to be a lack of courage. For example, with over 50% of people entering the city by public transport why aren’t there more bus lanes? Why are there choke points at some intersections with less phasing given to some bus lanes? It is an organisation with no appetite to make hard decisions. It will be interesting to see how it deals with carbon zero goals. Maybe AT will provide more direct routes and express buses if more people opt to use them. This may require a change to a fare incentive beyond the fare stage structure. With the Dominion Road eg, I have noticed some of the flyover buses were not that full compared with buses going along View Road. So it doesn’t surprise me that they have cut down the direct service, and increased the frequency of buses going along View Road. The fares go up quite a bit with each current fare stage travelled. For those travellin g the full length of Dominion road and beyond 5 days a week, this could work out pretty expensive. How about a cheaper rate for travelling on express buses on these routes, and for travelling more than one current fare stage on buses going more directly to the city? I don’t think they Dom road buses go further than zone 2. So isn’t that $3.30 max by HOP? I’m not really a fan of express buses, i’d just prefer all buses to be quick and direct. That means slightly bigger stop spacing, quicker boarding through all door boarding, no congestion through continuous bus lanes and more direct routes instead of zigzagging to boost coverage. The slightly bigger stop spacing, coupled with the fewer, more frequent routes, does mean though that people need to walk further. This means we have to provide the amenity required to make that walking safe and pleasant. Multiply that by return journey and 5 days a week (without concessions) and it’s $14 per week, which would be a lot for someone on a low income. yes i’m glad they got rid of the expresses on dominion rd and replaced them with the 252/253 all stops. Now we just need to get the 25B/25L to take the direct route too. If view rd is popular due to park n riders, then they can easily park somewhere on the new direct route. The View Rd buses are not the direct route for those that live in that area. The View Road buses ARE the most direct buses for those that live in that area. Still needs some buses along there. There are bigger gaps in the area bounded by Balmoral, Dominion, Mt Eden and Mt Albert Roads. I don’t see why View Rd residents are special. jezza, I grew up in that area bounded by Balmoral Rd, Dominion, Mt Albert, Mt Eden, well before it went upmarket – nearer Balmoral than Mt Roskill. Buses were always pretty accessible for my family on both Mt Eden and Dominion Rds back then. There are buses along Mt Albert and Balmoral Roads, so why not along View Rd? It’s a very well populated area, with quite a few blocks of flats – a few very near View Rd, and some are quite large blocks – probably a lot of people from these blocks getting buses. I live in a modest rental unit in a block – a bit of a walk from View Rd, and a longer walk to Dominion Rd. I don’t see any need to stop buses along View Rd completely. I suspect there could be a lot more buses doing the 253/2 route and probably fewer along View Rd if there were not so many park-and-riders there. I don’t think there’s as much residential street parking near the 252/3 route between Valley Road and the St James. I also didn’t see a lot of difference in speed on the buses that did the flyover route and those that do the View Rd route. I suspect the time differences may be due to the numbers of people getting on and off buses in View Rd at peak times. When there are not many people getting on and off buses there, it takes about 5-8 minutes between View Rd and the Southern Motorway over bridge. View Rd is not much more than 1km long, so at maximum it is a 500 – 600m walk to a frequent route on Dominion or Mt Eden Rds. There are currently people on say Landscape Rd for example that have a longer walk to one of those frequent routes. The dogleg down View Rd is absurd and is only there because they didn’t want to run the trolley wires over the Dominion Rd flyover. I used to do a similar walk to the Landscape Road one growing up. I also suspect it wouldn’t be so hard to drive along a road such as landscape to park closer to the bus stop if necessary. It was back in the day. I don’t see a problem now for having some buses going down View Road, especially as it is a highly populated area – in comparison to the bigger sections and lower density around the Balmoral Rd to Landscape Road areas. I don’t see why there can’t be both routes, with lower fares for those travelling the 252/3 route. That way, it would be easier to see the relative demand. If you look at the time allowed for the new timetables, there’s not much difference in time taken between Valley Road and Wellesley Street in the early mornings and at weekends – ie about 11-13 minutes. It increases to 20 minutes on the View Rd route at the height of peak time weekdays. When I go to work on Saturdays, I get the View Road bus between 7.30-8am. There’s usually quite a few people already on the bus – though usually not all seats taken. I suspect not many people board between View Rd and Wellesley Street on the 253/2 buses – there usually wasn’t on the flyover buses. There probably isn’t a need for that route at weekends or off peak.. I found sometimes the flyover buses used to get really held up in the evenings by the traffic down Dominion Rd to Valley Road. (Been on leave since soon after the new timetables so can’t compare the 253/2). Probably the best way to speed up the buses on either route is for there to be fewer cars travelling in peak times, and for fewer people to be boarding and leaving en route. Either way the View Rd residents will have to get used to it as the Light Rail will head down Ian Mackinnon Drive and the 25 buses will cease to exist. You’re right, the time difference isn’t massive, but it is a lot of passengers that are inconvenienced by this dogleg, so it is a significant impact. How far away is the third main between Puhinui and Middlemore? Depends on where your house is. Thanks good post. It will be some progress when the performance of the transport agency CEO is measured by the average speed of the public transport, rather than the average speed of motorway traffic. As for layover times – if we move towards a system with GPS, Apps and real time location information, we do not need them. The school holiday speed bit is interesting. The maths of traffic congestion is such that average delay increases exponentially as capacity is approached. A road going from 80% of capacity to 100% of capacity sees average delay double. So you can see that a 10-15% drop in traffic makes a huge difference. This is also why road pricing makes so much sense. You only need to deter or defer a small proportion of trips to have a large benefit. The Congestion Free Network shows the Southern Line skipping 5 stations between Punuhi and Newmarket, this would significantly cut journey times from the south, but presumably would require significant investment. I wonder if a more economical approach would be to construct 1 additional track between Otahuhu and Newmarket, to enable express services to operate unobstructed during peak times. I realise that any express service will need to wait until the opening of the CRL (unless the 4 Onehunga ‘phantom slots’ can be realised). The Regional Rapid Rail proposal also allows just 16 minutes for the journey from Puhinui to Britomart, this seems impossible without separated express tracks. The CFN concept is an operating change that requires no infrastructure investment, in theory at least. It involves the southern line skipping two stations at a row at Papatoetoe and Middlemore (they are served by the following eastern) and then the same from Greenlane and Remuera (served by the following Onehunga line train). These two sets of two are skipped simply by not stopping at the station, they still run through the same tracks. This should kinda work because you can save two or three minutes by each pair skipped, so you’ll not quite catch up to the train in front. The fifth is Penrose which is moved to being on the Onehunga Branch only, again by simply running through but not stopping at the platform. Ellerslie is kept as the interchange point and to serve the businesses there. Building a third track between Otahuhu and Newmarket would be pretty expensive. That makes sense, thanks for clarifying that. Would this station skipping still be possible at higher train frequencies? With regards to the RRR proposal, is it realistic for regional trains to travel from Puhinui to Britomart in 16 minutes with no additional track between Otahuhu and Britomart? From observation this pattern does not work well. Onehunga trains rarely get to run full speed between Newmarket and Ellerslie and frequently slow to a crawl or stop at a red signal at at least on of the stations they are supposed to be skipping. You would think it would work, but it doesn’t appear to in the real world. Once dwell times are reduced it should work better in real life. What about passengers from South Auckland working in Penrose? You want them to train to Ellersile and then change to a train to double back to Penrose? “Building a third track between Otahuhu and Newmarket would be pretty expensive.” What’s your price you’ve calculated? Yes Penrose southern line is a interesting beast, growing in popularity. Seems to be quite an important station with the geography of the roads and the new network bus routes. Yes, connect at Ellerslie, same as workers going to Te Papapa or Onehunga. A connected network of high frequency lines, like every proper rapid transit rail system in the world. I’m not sure how you think express trains on extra tracks would be any different, it’s not an express if you still stop at every station! So the 9.5km from Otahuhu to Newmarket would be at least $72m, but by the look of the corridor width and the number of bridge structures that would need to be modified I wouldn’t be surprised if it was several times that. That’s quite a price just so a couple of peak only trains can skip three stations. 53% Penrose trips are to or from Britomart, Newmarket, Ellerslie, Greenlane or Remuera. Mostly Britomart and Newmarket. 31% is to or from the southern line stations south of Penrose through to Pukekohe. 12% is to or from stations on the eastern and western lines. 4% is to or from Te Papapa or Onehunga. So certainly travel from the south to Penrose is not a insignificant proportion, but it’s by no means the major travel pattern. How many rapid transit systems have a situation where you have to travel an extra couple of kms down the line then back again only to get to a station that is right beside the line? Pretty much all of them in some capacity, from what I can see. Certainly in Melbourne and Sydney they have that, for example coming in on Melbourne’s northern group you have to come into Southern Cross, change trains then run back out north to get to the City Loop to access Flagstaff, for example. Same situation from the Southeast with Richmond to Parliament, via Flinders Street. In 2km to the transfer point then back out 2km again. Same with Sydney, come on a train over the harbour bridge you have to come in to Wynyard, change trains then run back the way you came to loop around to Circular Quay. ..and what about my new frequent route 66 bus goes through/around Penrose..ahhhh it goes to the Onehunga line Platform 3 side too..cool, Just need onehunga frequency improved before people would want no stopping at Penrose southern line. If you are approaching Melbourne from the Southeast you would just get off at Richmond and transfer to a City Loop bound service, no need to go to Flinders St. Same from the Northwest, you would just get off at North Melbourne and transfer. You are right at the moment the volumes coming from the south going to Penrose and the Onehunga line are small. However, the CFN will have higher frequencies and more people transferring to get across to Dominion Rd LR. This transfer should be as easy as possible and is worth an extra stop on the Southern line to make this so. I still can’t think of any example elsewhere where you would go past a station you can see out the window but have to keep going to the next station only to backtrack. To fit in with the CFN2 the current 66 crosstown route or it’s equivalent in the future (from Sylvia Park-Mt Smart Rd-Mt Roskill, Mt Albert to Pt Chev) could just be altered to terminate at Avondale instead. Almost a perfect horizontal line on the CFN2 schematic filling in that gap. Given there is a limited stops bus from Howick-EP highway-Greenlane West to Pt Chev on the CFN 2. Middlemore is not just another station, forcing transfers is problematic. Even with completely covered/sheltered stations and 2-3 minute frequencies it would still be problematic. True – Middlemore is a seriously busy southern station. Maybe people living in Central Auckland don’t realise the importance of this station? CFN has many flaws, this is another classic example. Middlemore is the 9th busiest station on the Network, well behind a number of stations on the network that only have one line running through them. I think you are overstating the importance of Middlemore continuing to have both lines stopping at it. It’s got nothing to do with how busy the station is and everything to do with the fact it’s a bloody hospital. That it’s also one of the busiest stations makes it all the more curious. Yes. There’s the need for patients to go as comfortably and directly as possible, but there’s also the requirement for doctors and probably some other key staff to live within a certain commute time. Middlemore would still be available for staff, it would just require a transfer of you are coming from the Southern line. How many patients are travelling by train that would struggle to complete a transfer? They would still have to get to the station and to the hospital anyway. That section of track will be the only section of track with the ability to run expresses once the third main opens, it seems crazy to then make all trains stop at three of the four stations along here. Western line trains will no longer run through Grafton once the CRL opens. Are you suggesting the running pattern should be altered for these as well so patients have a one stop trip to Auckland City Hospital? You could only contrive to compare Grafton (steep hill and busy, very wide, road) with Middlemore (literally stops outside the hospital, 10 metre walk) if you never use either. If we were just talking about express services that would be one thing, but we’re not. If we were talking about every other service that would be one thing, but we’re not. Middlemore, in the context of an ageing society and the hospital for everywhere round here (took me years to realise Auckland Hospital was something else), is transformative. But you who don’t use this line (GA being a bunch of West and Central Aucklanders) want to skip it. So Auckland City Hospital requires a train to bus transfer, but god forbid Middlemore has a train to train transfer. It doesn’t worry me if all trains stop at Middlemore as I don’t travel through here, the main benefit from skipping this stop is for those that are coming from further south. I hear regular complaints from these people about the lack of express trains. And we’re not talking about express trains. We’re not talking about some hypothetical world where we put a rail line right in front of Auckland Hospital. We’re talking about an actual hospital with an actual train station with actually non-stopping trains in an actually ageing society. And by express trains what is desired is express trains. Papakura, Puhinui, Otahuhu, Newmarket, Britomart. Add ellerslie to that list and you have the CFN stopping pattern. Nick the problem isn’t operating express train. The problem is that the CFN, as far as can be told, would permanently have the Southern Line (or the up line leg of the Red Line anyway) skip MIddlemore. If we’re just talking about running two peak express services (whether with Ellerslie or not, or Manurewa) out of six or even one during off peak (with whatever frequency that is), then I don’t see the problem. Express services skip stations. That’s the way they are. So be it. The issue arises when MIddlemore is a permanent transfer. Look, I know making Otahuhu into an interchange makes things awkward. Along that stretch of track we’ve ended up with four stations which are all abnormal. You get the 380 connection at Papatoetoe, a hospital at Middlemore, the Manukau spur at Puhinui and at Otahuhu you get all the busses. But if it’s going to be possible to have express trains, you might as well go for broke and basically stop no-where. I’m sure, for sake of argument, people would accept getting off at the Strand if the journey now takes twenty minutes from Papakura. We’re not talking about that but as an idea of what could be appropriate for an atypical running pattern I think it works. It’s getting more ambitious with the southern part of the Southern line’s typical running pattern that’s problematic. I think we are talking about two different things here. You seem to be talking about having both the southern and eastern lines running at fully frequency and adding a third express pattern over the top for a couple of peak runs? In my view that is expensive, in that it requires third a fourth tracks, and relatively low value, in that it only improves a handful of peak services. I am talking about making the southern line, half of the regular trains on the southern part of the network, express all day every day. This doesn’t require extra tracks if the scheduling can run the way I think: basically every second train between Otahuhu and Puhinui or vice versa skips the intermediate two stations and saves about three minutes. This would work up until each line is running at about six minute headways. Yes that is absolutely a trade off. It’s asking folk going to Middlemore or Papatoetoe to wait an extra five or six minutes to transfer (although they would have saved usually at least a minute or two getting there express), so that everyone going beyond there (about fifteen times more people from what I can see) can save three minutes, every time they travel. Yes, Nick, it is exactly the full day pattern I am criticising and have been criticising from the beginning. The tradeoff is not particularly justifiable for the reasons already outlined. At least, with Middlemore. Especially when with some infrastructure changes the trains could be allowed to unleash between Otahuhu and Ellerslie (since we’re skipping Penrose); it is my understanding that the junctions in the area act to keep speeds lower). At the moment this is one of the “it feels slower” areas (at least, in the run up to Penrose). The express services that I was discussing in the previous comment are a contrasting point of view. Running some trains, some of the time (whether it’s two in peak or one all day an hour… assuming frequencies at least as good as what is now for full track runs) with a very extreme schedule (ignoring well over half of the stations; although at the city end I used the current station arrangement) is quite different. The criticism of the CFN pattern doesn’t hold true of “strategic” services. Whirstler – anyone who can’t transfer trains to get to Middlemore must be very low mobility, therefore they must struggle to get to their nearest train station, so would have to live pretty close. I’m not convinced this is a very big group, if we designed the network around every small group that had a different need we would never get anywhere. One way to speed up trains without needing more tracks is, instead of having express versus all stops, you have skip stop trains, with each second train skipping a different bunch of stops. They all end up taking about the same, quicker time, so there’s no issue of the fast one being held up behind the slow one. For example, Perth to Fremantle in peak hours. The trade-off of course is that most stops only get half the frequency that an all-trains-all-stops service would give them. Another way of speeding up the trains is have the train manager unlock the doors as soon as the train arrives. I was on a train from Penrose last week and at each stop the train manager took around 10 seconds to unlock the doors. Multiply that by each stop, plus the time he spent phaffing around on the platform trying to look important before the train could leave. In a competently managed urban rail service an off peak minor station dwell should be no more than 25seconds, as is common in all Australian cities and, I’m sure, hundreds of other cities around the world. I believe the problem of journey-times being traded-off for punctuality stems from the financial incentivisation written into the contracts. Someone (in AT?) has decided that an appropriate measure of PT performance is the percentage of services arriving at their destination within a certain margin of scheduled time. Clearly it benefits the operator to pad the timetables in order to make the target easy to hit. I don’t know that there is any contractual incentive or mechanism for improving journey times. Passenger-aspirations for faster journeys simply fall by the wayside until political pressure forces the issue. Could be solved by having the contract stipulate that AT are in charge of setting timetables, with Transdev and Kiwirail as stakeholders. What if transdev say no or demand huge amount of subsidies? 1. See if Kiwirail or anyone else wants to run the trains. 2. Bring the train operation in house. Either way it seems crazy that Tranzdev get to decide the train timetable. AT own the trains and Kiwirail own the track, the two things that actually determine how fast the trains can go. Only if AT was to become a licence holder under Railways Act, and have a safety case. They have never wanted to have this responsibility. Just for the record and replying to the headline graph, anyone who believes the 2003 timetable reflects the actual trip times in 2003, is forgetting how it was before double tracking. Delays of up to 100% were very common. At least now operations are within 10% of the timetable most of the time. Very true. People often like to make references to the running times in timetables from this period but the reality was the timetables were unworkable and unreliable with trains often late. The current timetables have A LOT of ‘fat’ built into them to help the operator (Transdev) achieve ‘on time arrivals’ within the performance levels specified by AT. The current system is set up so that the operator gets performance bonuses if it achieves the monthly performance stats. This is where Transdev can make money. This is also why Transdev doesn’t care about fare evasion and discourages its staff from delaying trains for dealing with fare evasion or any other issues, as they don’t want to compromise their ‘on time performance’ stats. When Tranz Rail (and New Zealand Rail before) used to own and operate the entire suburban network, they were simply just paid an operating subsidy by the Auckland Regional Council. All fares were part of Tranz Rail’s revenue, so there was a strong emphasis on train staff to ensure all passengers paid. There was also much greater ability for train crews to operate trains faster to make up time with DMUs (and later SA trains) in the absence of ETCS which the EMUs have. ETCS is the primary reason the EMUs are no faster than the diesel trains they replaced. There is no way to make up time with a late running EMU other than to offload the passengers and run empty express to the terminus point – good for ‘on time arrival’ stats, but not good for passengers wanting to get from A to B (particularly when it is raining with a train load full of people trying to huddle under one small shelter at a suburban station). Full responsibility for all of Auckland’s train operations should be transferred to KiwiRail. Even I as a more recent avid PT user will use the car when the routes don’t work well due to the geography and/or PT route setup & time is limited. In Mt Wellington, getting PT to Pakuranga (and beyond) is very slow considering the distance. Via car it’s fast as with the Waipuna Bridge. Via PT it’s setup to all go via Panmure with transfers (or south via . Even with AMETI complete, without having a route over this bridge it will be slow. Real life example the other day I’ve commented before is 20 mins by car & just over and 1hr via PT IIRC. Heavy rain and was Sunday didn’t help but the Sunday only really made a difference of ~6 mins walk at the start of the route instead of using a bus. Slightly off topic: Anyone know if the Pukekohe Station/Interchange have the walk bridge open to both sides…about time I visited to see the new station working…don’t want to see half working stuff…probably better weekday though with those hourly Puke trains….bring on the new timetable. The footbridge and platform works are still not completed despite the new interchange being ‘officially’ opened some weeks ago.. Despite all the rhetoric from the politicians and AT officials during the official opening about wanting to see more people using public transport, the number of cars present belonging to those who attended spoke for itself. Do as we say, but don’t do as we do..
With the increased service frequency coming with the new timetable, some serious attention is going to need to be made regarding the ADL DMU fleet. All 8 of the remaining operational units are going to be needed to operate the timetable, including hot spare and maintenance cycle. With the bare minimum of maintenance being spent on the ADL DMUs by AT and Transdev, this is going to leave the service reliability vulnerable with the increased strain on already run down vehicles and no spare units should one suffer a major failure / accident. With the electrification to Pukekohe not due to be completed until 2022 now, the Government / NZTA should provide funding for KiwiRail purchase all the ADLs off AT and fully refurbish and upgrade all ten. Two of the ten could then be used to start an hourly Henderson-Huapai rail shuttle service which could easily be up and running within a year – much quicker than buses on congested roads or waiting decades for the possibility of light rail reaching Kumeu. Once electrification is completed to Pukekohe, some of the ADLs could then be re-deployed to Tauranga to start a new much-needed suburban rail service there between Apata-Tauranga CBD-Mt Maunganui-Te Puke. Hi Robin, I’ve just done a google search on greater auckland posts involving the ADL shuttle idea for Henderson to Huapai. I’ve found you made the suggestion several times, and a few others have, but there’s been next to no response. Surely, “all hands on deck” to remove traffic from SH16 (bus lanes on GNR, bus lanes on SH16, train to Huapai) so they can put light rail on the NW will mean the shuttle idea can come into its own? Please, train boys and girls, fill me in on why this wouldn’t work. I saw a business case a while ago with a BCR of 0.5, basically it doesn’t make economic sense. In a nutshell the population in Kumeu is too small and to spread out and the journey to the CBD is too far by train. In addition to this not that many people in the area actually work near the train line. I had heard there is an interim bus proposal for the NW prior to LR being built, however I don’t know any of the details. I’m guessing it would be similar to the Northern Express prior to the busway opening, where it just used shoulder lanes on the motorway. Hmmm…. thanks. I hope they consider it when they consider different LR options. Thanks for replying Robin, only just seen this, doing a big blog catch up after been busy with other things pretty much lately. All units in action sounds a bit precarious. Perhaps this are plans to put into action/make workable spares of two other ADLs (have I got this right)? With Pukekohe electrification not due to 2022 or later and the concern over ADL reliability then is the purchase of that last tranche of AM emus going to include the battery option? I.e. IPEMU. Those two ADL sets at Henderson are, I assume, the two unserviceable sets. They look ok so is it mechanical failure of some type? Pretty sure they decided with the new government’s commitment to an earlier date to electrify Pukekohe they decided to not go for the battery option. Excellent work! I’d love to see the same analysis for Papakura – Britomart. AT might have all the old timetables lying around somewhere? The new train timetables, effective from 26 August, are now on Auckland Transport’s website. I note the new timetables don’t have the exact timing “bold” stations like they used to. Wonder if that’s because they will all be exact now or they just left that out 🙂 ? Also there will be matching changes to a lot of southern buses to match & make times more accurate I see…can’t see their timetables up yet when I looked earlier today.